The 288 sponsors in the Directory answered a 10-question survey asking about their experience, eligibility requirements, fee structure, services and philosophy — enough information that prospective projects can get a feel for which fiscal sponsors might make a good fit for them. 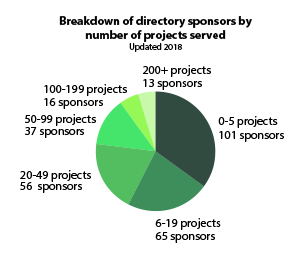 The Directory, launched in November 2008, has grown to be the largest database of essential information about individual fiscal sponsors; it includes most major players and an increasing number of startup sponsors. These sponsors operate in 36 states, the District of Columbia, Ontario and Puerto Rico. California has the most, 101, more than a third of the total. Community foundations comprise 4% of the fiscal sponsors in the Directory. Public Health Solutions is the most experienced fiscal sponsor in the Directory — since 1957 — and sponsors three projects now. TSNE MissionWorks started two years later and sponsors 59 projects today. Fractured Atlas in New York City is the largest fiscal sponsor with 4,200 projects. 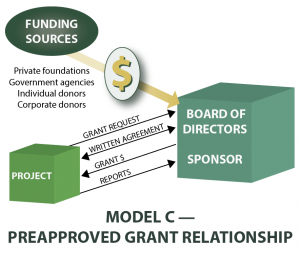 It operates only online and practices only Model C fiscal sponsorship. Model A, the direct project, is practiced by 90 sponsors listed in the directory.Before the 1950s, only 152,000 501(c)(3)s were operating in the United States. The pace picked up in the 1970s and ’80s, adding roughly 190,000 new nonprofits in each decade. But numbers of brand-new nonprofits almost doubled — to 372,000 — in the 1990s. GuideStar’s database had information on more than 1.8 million U.S. nonprofitFiscal sponsorship, on a much smaller scale, has followed that trajectory. Starting in the late 1960s and into the 1970s, when community programs began to soar as the free-services-for-all concept took hold in California and spread throughout the nation, the need for cost-efficient financial management grew, and the business model gained currency. New fiscal sponsors jumped in the 1990s. That’s when 44 of the sponsors in this Directory — more than double the number of startups in each of the previous two decades — took on their first project. The pace of new fiscal sponsors has accelerated, with 176 of Directory participants, or 61%, forming since 2000, a percentage that has been rising as the Directory continues to add fiscal sponsors. Fractured Atlas has the most projects of the fiscal sponsors listed in the directory. The role of the fiscal sponsor has taken off. Though the numbers of fiscal sponsors and the projects they host are minuscule compared with the vastness of the nonprofit sector, fiscal sponsors are an important factor in the increasing quality of nonprofit management, a trend widely acknowledged as awareness of fiscal sponsorship’s benefits spreads throughout the sector. These 288 fiscal sponsors are home to 14,768 projects, more than a quarter of which are housed at Fractured Atlas. Many sponsors in the Directory are of modest size. More than a third (35%) of the agencies sponsor 0 to 5 projects, and 13% sponsor 50 to 99 projects. The 13 organizations with more than 200 projects collectively sponsor 7,675 projects, 52% of the projects represented in the Directory. A hidden efficiency for nonprofit board development is suggested by the projects-to-sponsor ratio, which is 53 to 1. The 14,768 projects under their fiscal sponsor’s board of directors don’t need a board of their own to operate, which takes pressure off the pool of volunteer professionals across the country. A truism of community service is that many board members wear multiple nonprofit hats. If each of the 14,768 projects had to have its own board of directors, more than 140,000 civic-minded people in communities across the country would have to stretch themselves ever thinner. There is some specialization among fiscal sponsors in terms of their projects’ services, but, not surprisingly, arts and culture, hands-down, is the most popular project category, with 212 — 74% — of the sponsors willing to take them on. And of these, film and video projects are a major subcategory. Education is the next largest category of service with 169, followed closely by youth development at 165, and children, youth and families at 147, a snug third. Almost half of fiscal sponsors say they charge a percentage of project revenues, and, of those, 44% are in the 5%-10% range. Also, of those with sliding-scale fees, usually depending on a project’s revenues, about a third range from 5% to 10%. Forty-eight sponsors will charge 12% or more to handle government-funded projects, which can require adhering to higher federal audit standards. What mostly accounts for the disparity in fees is the range of services a sponsor provides. Attorney Gregory Colvin’s Fiscal Sponsorship: 6 Ways to Do It Right, published in 1993 with an expanded and updated edition in 2005, a Kindle edition in 2015 and a 3rd Edition due in 2019, is the most significant publication in the field. Colvin’s book has had great impact on fiscal sponsorship. It changed the nomenclature of the field — from “fiscal agent” to “fiscal sponsor” — helping the culture of fiscal sponsorship evolve. The term “fiscal sponsor” has helped to professionalize the management model from the days decades ago of “fiscal agency,” when the relationship was called “a trap for the unwary” funder. Among the sponsors in the Directory, 56% or 160 practice Model C, the preapproved grant relationship. 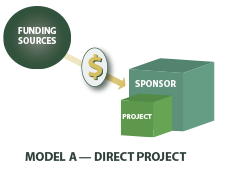 The second most popular scenario, Model A, the direct project, is practiced by 113 sponsors, 39%. Fifty-one sponsors, 18%, practice both. The basic service all fiscal sponsors provide their projects is the sharing of their 501(c)(3) charitable status, ensuring donors’ gifts and grants are tax-deductible. Bookkeeping/accounting and bill paying are the primary services sponsors provide their projects — more than two-thirds do one or the other and most provide both. Only a third of the sponsors handle their projects’ payroll, which reflects the trend to Model C. About half provide organizational development and tax reporting. The larger, more experienced sponsors, according to survey results, tend to provide a spectrum of financial services — all of the above plus they usually handle insurance and auditing. This explains why experienced sponsors’ fees are on the higher side — more services, more staff time required. These highlights from the fiscal sponsors in the Directory were updated in November 2018.